The Edison Electric Institute (EEI) has come out with a new report that identifies the potential for electric vehicles (EV) as a way to boost electric sales for utilities and urges utilities to invest in the infrastructure necessary to get EVs on the road and interacting with the grid. For utilities, there are four essential advantages to EVs, according to the report: ​EVs increase electricity demand; EVs provides a means of interacting directly with consumers; ​EVs fall in line with environmental goals; and, EVs could be used for the utility's own fleet and potentially reduce operating costs. There are about 225,000 EVs on the road in the U.S. today but few charging stations and no universal communications and control networks are in place — but that may soon change, thanks to a new EPRI pilot program announced earlier this week. "Stagnant growth, rising costs, and a need for even greater infrastructure investment represent major challenges to the utility industry," writes EEI. "Today’s electric utilities need a new source of load growth -- one that fits within the political, economic and social environment." 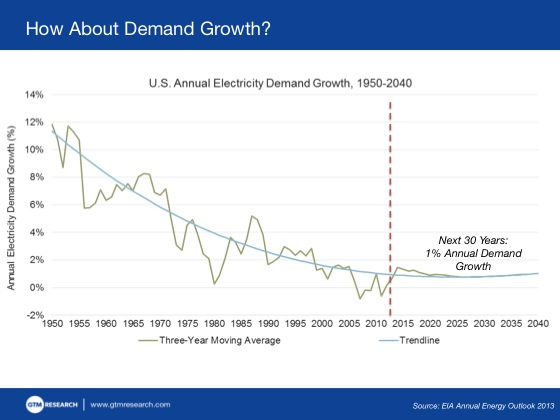 Demand growth has been virtually non-existent for most U.S. utilities as customers seek to reduce their energy consumption. But a recent OPower analysis found that EV owners use 58% more electricity on average than other customers, which represents a significant boost for sales and an opportunity for the utility business. EVs can also be used as grid assets to help integrate more solar and wind generation into the grid by taking and giving power, depending on the situation. "The bottom line is that the electric utility industry needs the electrification of the transportation sector to remain viable and sustainable in the long term," write the authors.